Think of spectacular popular protests, of the kind that make clever use of technology to mobilise support, flummox the authorities and disseminate facts and images. In many countries, that sort of approach has been well used by political opposition movements, bent on overturning regimes or reversing electoral fraud. But more recently, both lone dissidents and bigger campaigns have been employing the latest “people power” techniques in a different way: challenging bad environmental decisions, especially the sort that result from corrupt or non-existent governance. Eco-protest may lead, in time, to political change, but the focus is narrower. At a recent conference in Athens on corruption, campaigners from many countries brought stories of their efforts to challenge environmental abuse in innovative ways. In Armenia, for example, the local branch of Transparency International—a global anti-corruption movement—has to contend with a government that seems humourless and harsh. So campaigners against a proposed mine in northern Armenia, which risks destroying a pristine forest, devised colourful responses which the authorities couldn’t repress without looking foolish. In a recent street protest, they dressed up as animals; in another they staged a “funeral” for a slice of nature that was at risk. 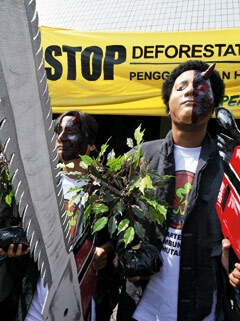 Some eco-protests are masterminded by global NGOs, drawing on a vast pool of experience with manipulating images. Others are dreamed up by local people with few assets other than their own desperation. In the most successful actions, both elements are present. In recent weeks, Greenpeace and its local supporters managed to embarrass the government of Papua New Guinea by climbing a crane to stop a shipment of timber. But even in places to which global NGOs have little access, the ease with which images and sounds can be disseminated has tilted the balance of power in favour of environmentalists. Take the fallout from a deal between the Russian aluminium concern Rusal and the government of Guinea to mine bauxite. Green protests were the last thing Rusal expected. But Kamara Secu, a leader of the Guinean community in Russia, was undaunted. He rang Rusal’s press officers and taped their response; they were dismissive and mocked his accent. Mr Secu then posted a recording of the exchange on YouTube, the video-sharing site; it was picked up by green bloggers, and helped to rally support for a demonstration against Rusal. Or consider the recent history of Belovezhskaya Pushcha, a forest park straddling Belarus and Poland. The Belarus side is managed by a well-connected agency whose new boss has been urging his staff to cook up arguments in favour of commercial logging. Heorhi Kazulka, a forestry official who lost his job because he refused to play ball, is waging an online battle to publicise the park’s destruction. What began as a lone effort has attracted many supporters who offer tips and photographs. Jon Corbett, of the Centre for Social, Spatial and Economic Justice, an affiliate of the University of British Columbia, was first involved in Indonesia’s anti-logging movement in the 1990s, in the pre-internet age. Today, he says, things are far easier: local campaigns against big commercial and political interests at least have a chance, especially if they win global attention. Blogs play a crucial role in attracting people to marches and sharing information. In Iran, bloggers mounted a campaign to publicise the threat to wetlands from roads and dams. Bulgaria’s bloggers campaigned on behalf of the Strandzha Park, the country’s largest protected area, targeted by commercial developers; they used a panoply of photo, video, and petition sites. Bloggers in Poland placed special “green ribbons” on their sites to show their solidarity with a campaign to save the beautiful Rospuda valley from new roads. Open-source video-editing tools and publicly available sounds have made the creation of educational materials virtually cost-free—but that doesn’t mean that eco-blogging is safe. Earlier this year an Egyptian blogger, Tamer Mabrouk, posted material indicating that a local firm had been dumping chemicals into Manzallah Lake and the Suez Canal. The photos were noticed by a government newspaper which denounced the firm—and Mr Mabrouk was duly arrested for defamation. Electronically co-ordinated protest over green issues isn’t confined to failed or authoritarian states; it has a role in well-organised democracies, too. In Greece, for example, ten NGOs and a network of local activists dotted across the Aegean are resisting a controversial planning change that would make it easier to build holiday houses on the islands. George Papandreou, the opposition leader, has denounced the plan as an example of the state’s capture by special interests, implying that the only hope of fighting back lies in the mobilisation of ordinary people, determined to save whatever remains of the country’s pristine beauty. Athenian newspapers, including pro-opposition ones, have kept an odd silence on the issue, a silence some Greeks ascribe to the power of the construction lobby. Cyberspace, at least, crackles with the controversy.